As a mom who greatly dislikes cooking, I've found it takes the sting out of the drudgery if my family notices how good supper smells. It gives me at least a few moments of pleasure for the work I've put in. Have you ever noticed that the things that smell the best are the ones that have been cooked or baked? The ingredients, in and of themselves, don't smell good, and even when they're all mixed together, they still don't necessarily smell inviting, depending on what you're making. The things that smell the best are the things that have been cooked or baked. Could it be that we're food in God's kitchen? Maybe we're God's cakes and cookies? That sounds nice doesn't it? Something tasty that brings smiles and enjoyment. 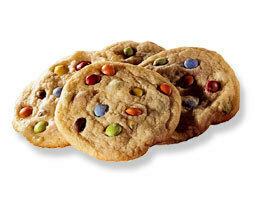 But think about a cookie recipe, or about any other recipe you might find on the dinner table. Many of those dishes and desserts have something in common: going through heat, either on the stove top or through the oven. If we were to skip that step many things would inedible. So many times in my life I've done my best to escape the heat. That 'Get me outta here!' panic button is one of my favorite buttons to use. In fact, it's usually the first one I run for. But when I do get out of the heat, I find myself half baked and not ready for the next step in my life, and basically, inedible. That heat phase (whether on the stove top or in the oven) is often necessary for my well being. Besides that, the Bible is full of references talking about offerings that were a soothing and pleasing aroma to God. Now, since God never changes, He still delights in pleasing aromas. Don't hit the 'Get me outta here!' panic button, and don't bail out before your cooking and baking process is done. If you do, you'll be a half baked lump of goo that just might be inedible and destined for the compost pile. Trust God to know just how much heat you need to make you not just edible, but tasty. Going through the heat releases and increases the delicious aroma, and we all know what it's like to walk into a house that has a busy kitchen--the fragrance draws everyone straight to the kitchen. May we draw people straight to the throne room of God. Next week, here on Patterings, I'm starting a study of James and we'll talk more about being in the heat, staying in the heat, and becoming better because of the heat. James is all about spiritual maturity and living out our faith. and the letter D.If you're joining in the meme, be sure to link up with us at the end of this post. Find more info about the a 2 z meme here. Life for me has morphed into a series of taxi and delivery trips. For the most part I've accepted it and simply roll with it. (LoL. Pun intended.) The problem came on a day when my trips dropped from three trips to two to one trip out. I truly thought I had it made in the shade, complete with koolaid to celebrate. I just knew I would make great progress on my writing goals for the week. That's when the bomb detonated. I was left coated with the slimy, stinky, yucky doodoo of a rotten attitude. I'm not one to get hung up on getting my own way. Really I'm not. But I couldn't have proven that on that day. In fact, evidence suggested that I delude myself into thinking I'm laid back and willing to flex and roll as needed. It took me six hours to do what needed doing, consuming the majority of my usable day. I was so disappointed. And mad. My rotten attitude came from clinging to what I wanted to do and it landed me in deep doodoo. It's not a fun place to be. 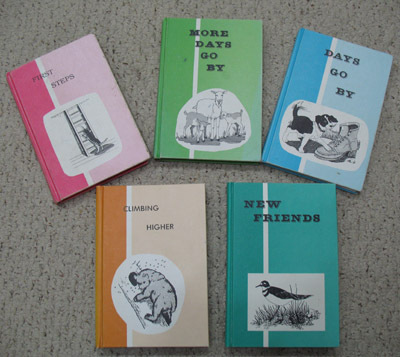 Doodoo stinks and the stench clings to you for awhile even after you've walked away and scraped it off. The stink of doodoo cancels out the fragrance of Christ. Don't want the stink and mess? Stay away from the doodoo in the first place. The best ticket out of doodoo is to take our thoughts captive. If they don't glorify God, they need to be taken captive. Once they're captive and confessed we need to replace them because if we don't fill that void, the doodoo will return "bigger and better." Intentionally dwelling on those things will clear out the stench of doodoo and replace it with the sweet fragrance of Christ. I don't know about, but I don't like doing doodoo. Let's take our thoughts captive and dwell on the things of God. If you're joining us for the a2z meme by posting on your blog this week about the letter D, be sure to add your name and the link to that particular post in the linky gadget here. Patty, what do you do with kids younger than third grade? My three are ages 3-7 and I'm struggling to finish the school year from last year (we did just adopt a 3 year old in March, so that got us way off schedule)... It's hard to homeschool with a three year old around, especially since she doesn't speak English very well yet and we're still working on learning obedience and just everyday living. Any advice is much appreciated. Homeschooling for the Challenged is what I do with my older kids, but until they've learned to read we sat and did school together—whether it was at the kitchen table or on the couch, we were together. To change things up, we used both locations throughout their school day, going back and forth as needed. My sister Cheryl happened to have Christ-Centered Curriculum and since her boys were beyond it, she passed it on to me. I laminated the flashcards and have used it to teach my kids to read. When they were ready for it, I moved them into Abeka's Language Arts third grade book. Christ-centered Curriculum gave them a great foundation. For readers, we used Abeka's readers (which I purchased at used curriculum sales—one here, another there), and Pathway Readers , all of which the kids loved. Pathway Readers are about Amish families but do not put forth Amish beliefs or doctrines. Both sets are wholesome stories. I've spent hours listening to kids read to me—at the table, in the living room, as I fold laundry or cook. Anytime I could listen while my hands were busy was fair game for reading time. we only did phonics and math. It was enough. When they could read well enough to muddle through a paragraph of History or Science, those were added in. It was completely based on the child's readiness. That meant my oldest went through that first “school year” twice (he wasn't ready the first time and neither was I), my older daughter (#2 in the line-up) went through once, and my younger daughter (#3 of 5 kids) went through zero times, officially. That was when I finally wised up. See, while I was doing school with older two, the little ones played on the floor nearby. I thought my daughter was just playing with her toy dishes on the floor, but she was listening too. She listened as we drilled phonics, read History and Science lessons together, and as I asked them questions about what we had read. And then she answered those questions. After I was done with her older brother and sister, I sat down with her and the flash cards. She knew them. So, I pulled out First Steps—the first reader—and we began to work through that. I didn't have to teach her—she already had it figured out because she played quietly, nearby, during school. They happened when I needed to help one child but not the others or when I had to take training time with the toddler. One on one time with the kids happened while the others were doing things in school that they didn't need my help for—worksheets, penmanship, running around the house. Yes, there were days I sent my son out to run around the house two or three times. He loved it and it cured his wiggles. Did things always go that smooth? Of course not. I was schooling three kids with an infant in my arms and a toddler playing on the floor. Some days we quit after an hour and other days we caught up because everyone was co-operating. Some days it took three tries to get school done and Jim was walking in the door when we called it a wrap. Life happens. Especially when you have little ones. Be willing to try different things to find what works for you, realizing what works one week might not work the next. I love the Old Testament. Genesis, Exodus, Joshua, Judges... on and on. But I have to admit that when Numbers 4 jumped out at me, I was surprised. When I read about the Kohathites and how they carried things, I could relate to some degree and it was encouraging as well as sobering. Won't you join me at the Cafe? When the farmer started spraying the field next to our house one day, we ran to close windows and make sure all the kids were inside—I just don't like the idea of farm spray floating into my house and having my kids caught in it. The farmers were getting ready to plant soybeans, so they have to kill out the weeds that are currently growing, to make space for the new plants. 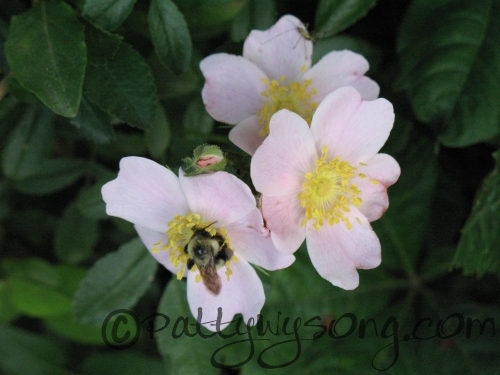 Many times the over-spray has drifted and killed good fruit trees and other plants, but there's not much you can do about it. They need their crops, and they do try to spray on calm days. There have been times that I've felt like I was caught in a cloud I shouldn't have been in, a cloud of weed-killer and that it was killing off all my good plants. Later I've been able to see that it was God preparing me for the seeds He was going to plant in me. He wanted those seeds to have plenty of room to grow without being choked out by weeds so that He could reap an abundant crop. If I were to cling to those plants that I thought were good, I would have an ugly field full of weeds, I wouldn't be living up to my potential, either—the potential of bearing fruit for God and His kingdom. 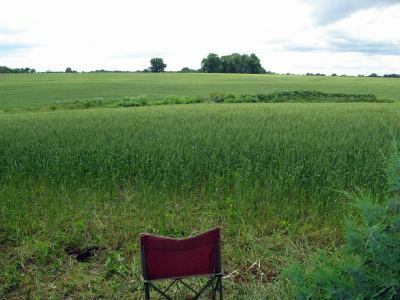 I want the field of my life to bear not just a crop for my Father, but an abundant crop for Him. That means allowing Him access and submitting to the weed-killers, as well as any discing and plowing God wants to do in my life to ensure a good crop. It means letting God plant anything in my life that He wants. Father, do whatever You need to in me so that You can reap a bountiful harvest from my life. I know that the process may be uncomfortable and difficult at times, but I trust You and want what You want for my life. I love You, Lord, please work in my life for Your pleasure. and the letter C.If you're joining in the meme, be sure to link up with us at the end of this post. Find more info about the a 2 z meme here. A couple weeks ago I received a text from my sister, Cheryl. That shouldn't be startling, but it was. I seem to forget that she's textable. Ridiculous but true. So I get a text from her and three minutes later it's decided I'm going to visit her. I'm still floating with the clouds. So tell me, what's a girl to do... Count down the days!! Fun I had making a sea cluster...Those will be my flip flops beside the chair soon. In the meanwhile, I'm working on a few clusters as I do some custom designs for clients. It's helping the time go faster, especially since I love what I do. =) Sometime soon I'll show you my most recent ones. I love them because they chose fantastic colors and elements. So fun to work with! So tell me, what are some things you do that start with the letter C? If you're joining us for the a2z meme by posting on your blog this week about the letter C, be sure to add your name and the link to that particular post in the linky gadget here. 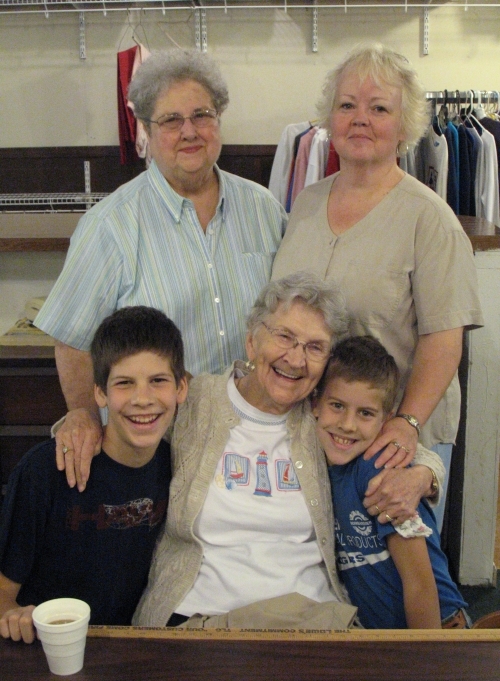 My younger boys with some of the clothing room ladies. A few years ago my daughters began helping in our church clothing room. It was to be for only three or four weeks, but it's grown into three years now and my boys have joined the team. It's been a life changing experience for all of them. The ladies they work with could easily be their grandmothers and great-grandmothers, and the love that's grown between them is comforting to everyone involved. There have been times I've not been able to accompany the girls to the clothing room, but I've never had to worry about them. 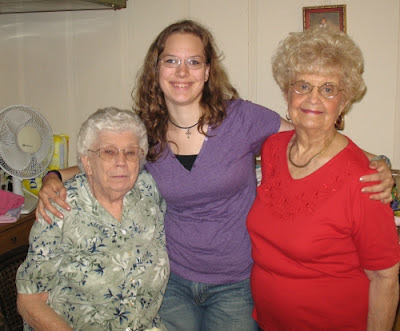 I know their adopted grandmothers keep a close, loving eye on them. Through working at the clothing room my children have seen and heard things I would've protected them from. The attitudes, language, tattoos and dress (or lack of it) they've been exposed to is enough to make me cringe, but it has been good. They now see a different side of life than what they see within the safety of the four walls of our home. It's opened their eyes and help them truly see the difference God makes in a person's life. It's also given them compassion to temper and displace the judgment they once felt. 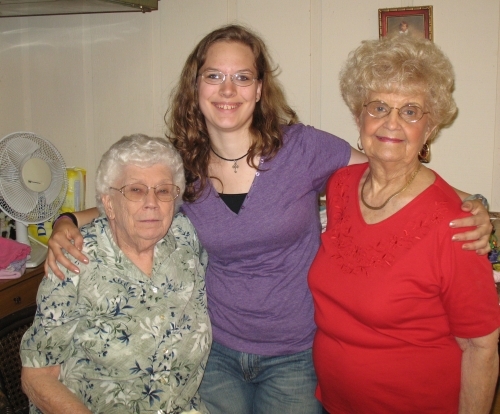 My older daughter with some Clothing Room ladies. Volunteering at the church clothing room has been a conversation starter for topics I wouldn't have thought to talk about with my children. As we work there, we often over-hear conversations of patrons and get a glimpse into their broken lives. We've talked about what's gotten people into the situation they're in and how to avoid such things. The kids have seen a glimpse of the dross of the world as it is, not the shiny face Satan tries to portray, and it's made a difference in their lives. Instead of seeing those times as unwelcome exposure to outside influences, we use them as teaching moments. They've convinced me of a few things we need to do for our children, things that aren't always comfortable. ways to interact with others different than they are. ways to serve others, both those less fortunate and those “better off” than they are. ways to contribute meaningfully to the world around them. a view to see the difference God makes in lives. opportunities for volunteering, expecting nothing in return. These opportunities are eye-opening for children and can help them develop into well-rounded adults who care about others and who are less judgmental of those who are different or less fortunate than they. It can safely show them the difference Christ makes in a life. I love hummingbirds. They constantly astound me. Awhile ago, during a pretty intense storm we stood at the windows and watched the trees whipping and branches falling. And the hummers. Those little birds didn't let the high winds and sheets of rain deter them—they zipped back and forth between the feeders and the trees, barely fazed by the storm. At one point there were two hummers at a feeder and when the wind suddenly gusted, they both faced into the wind and kept flying. As I watched, I saw one drop closer to the ground and manage to slowly fly forward, but the other was pushed backward and into the trees that line the creek. 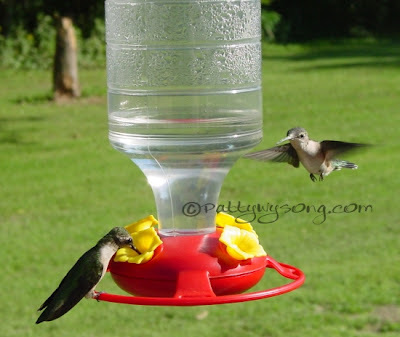 Both hummers kept flying until they were able to latch onto something. Then they were back to the feeders for another snack. Their persistence in the face of the storm wowed me. And shamed me. How many times do I get a little wind in my face and decide it's time for me to hunker down? And that's not even storm winds. In the storms of life I tend to head for my rock—the one I like to hide under. But that's not the rock we're supposed to run to. When the storms of life come, we're to keep flying and get to our Rock. Yanno, our ROCK: Jesus. When we run to that Rock, we can take refuge—hide—there with Him. That's very good news to me because I'm a hider. Knowing that I can run to my Rock and crawl under is so very comforting to me! When life's storms start howling, I can face into the wind and keep flying, just like those little hummers did, and fly back to my Heavenly Father. There, with the God of all comfort (2 Corinthians 1:3) I'm safe and secure under His wing. So when the storm starts howling around you and the wind has life whipped into a frenzy, be like a hummer and just keep flying. Fly straight to Jesus, our ROCK and redeemer. He will tuck you close under His wing and shelter you from the storm. And like a hummer we can dart back and forth, safely, knowing that His eye is on us, ever watchful. Our rock, our fortress, our deliverer. What more could we ask for? and the letter B.If you're joining in the meme, be sure to link up with us at the end of this post. Find more info about the a 2 z meme here. My family is NOT a quiet family. We all have strong personalities and even the two of us who appear "easygoing" are not--it's just a thin layer of easygoing over a mile-wide stubborn streak. Needless to say, tempers flash often here. One day, recently, one of my sons came stomping into the house. He wears big boots so everyone knew he was ticked. Even Toby. Being the loving, kind, gentle mother that I am NOT, I wanted to get through his thick skull and remind him there were better ways to handle his anger. It worked better than magic. His anger fizzled and the girls giggled. Music to this mom's ears. So, the next time you're tempted to blow your top, try Bummer! instead. And for extra oomph, get the twang in there too. The short version is sooooo much better. LoL. If you're joining us for the a2z meme by posting on your blog this week about the letter B, be sure to add your name and the link to that particular post in the linky gadget here. Teaching our children about God and living out our faith before them is important, but there's another thing we want to teach them, and that's to serve. 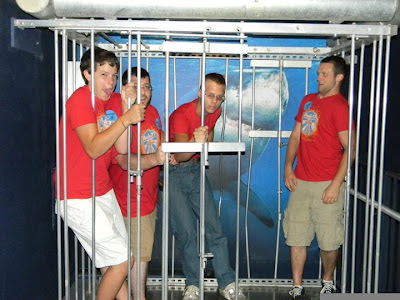 My oldest, just left of the shark--on a fun day on their missions trip. 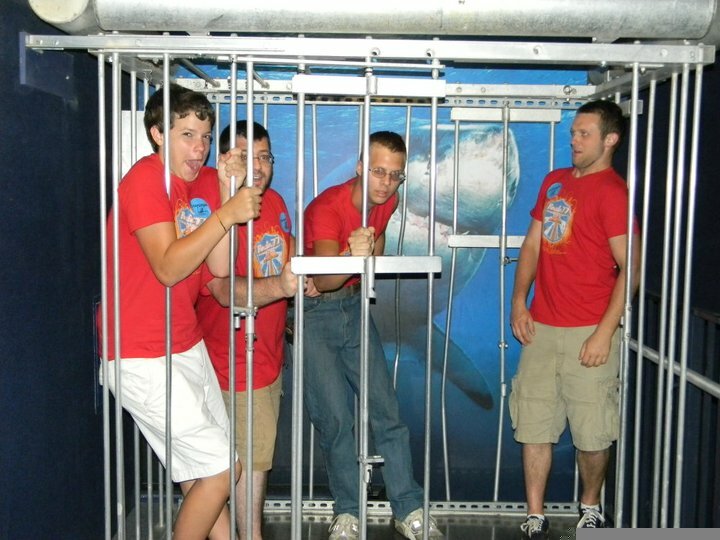 Recently my four older children went on a youth missions trip with our church youth group. This is something they do every year instead of going to a church camp, and I love it. They get to meet other kids their age, attend fun youth Bible meetings once or twice a day where they hear God's word and have those mountaintop experiences, and do something good for others. 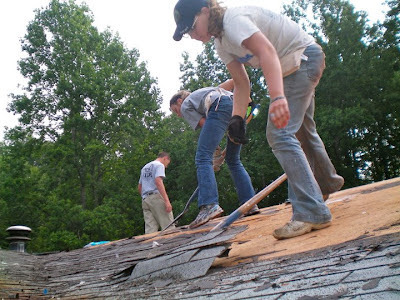 Often they're roofing or painting a house and, through teamwork, they get the job done in the five days they're on the job. They work hard, but they also see the joy of the homeowners, and have seen people saved as a result of their work. Many of our church kids have been saved on these missions trips and others have rededicated their lives to God. It's not the church's responsibility to teach my kids to serve. It's ours as parents. My younger daughter and a church lady she helps. To do that there are several things we've done. Our church has a clothing room for the community and we spend one morning a week there helping the ladies who run it. 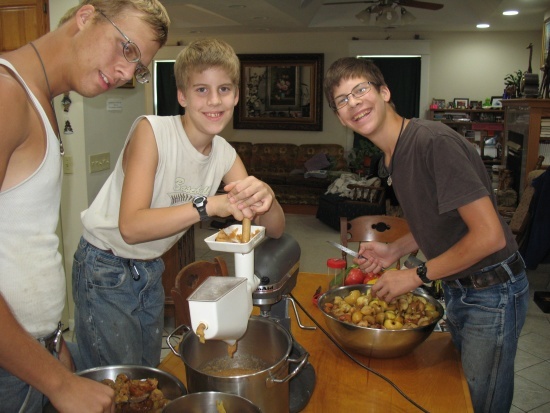 Another way to teach your children to serve is by helping with the set-up and clean-up for church dinners. Wiping tables and putting away the tables and chairs isn't the funnest job around, but it's a great way to teach the kids to help in any way they can, even if it seems small and insignificant. Last Spring we discovered another way to serve. A well loved man in our church died, and as is custom, one of the Sunday School classes was in charge of the funeral meal for their large family. They needed help and contacted a younger class, the one I attend. 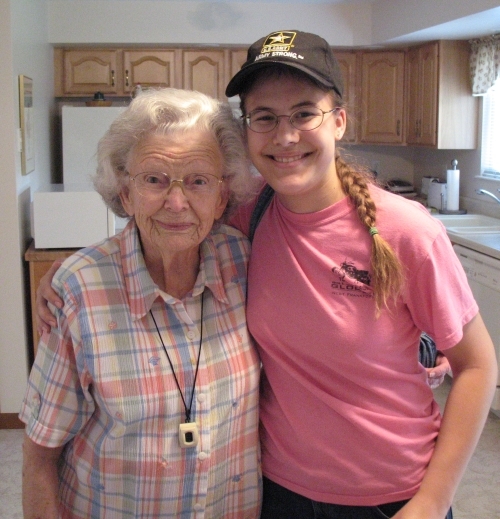 We not only prepared dishes to bring, but we spent the day serving the meal. Set-up, serving, and clean-up. The older ladies were thankful for young legs to do much of the running and, once again, my girls saw another side of christian women in action. It means giving up a day of working at home and a day of school for the girls, but it's worth it. My older daughter, roofing on a missions trip. As we've served together, we've noticed something. There are two kinds of servants: those that serve out of duty and those that serve with a smile. We've spent time talking about this in our family, and we've talked about the results. Sadly, the kids have noticed those that serve out of duty because they tend to snap at others or are sullen as they serve, but it has made them see the importance or serving with a smile and with a good attitude. They also have seen people that serve out of love and the difference that love and their smiles make. Let's be sure to teach our children to serve God in every way, and in any way they can. And more importantly, let's teach them the importance of serving with a smile. Serving out of love for God and love for others is the key to serving. Yes! a 2 z is starting up again today! I'm so excited! 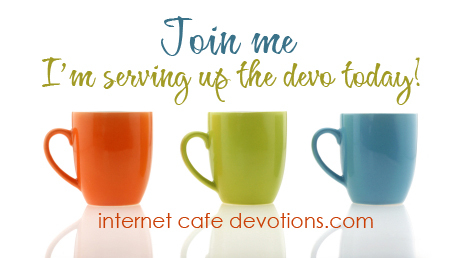 This is one of my favorite posts every week--it's a bit of a free-for-all for me. A time when I can post about anything I want...as long as it relates to the week's letter. This week, of course is the letter A. 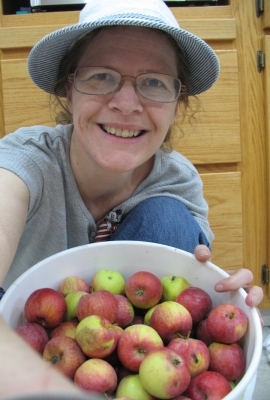 Me and a bucket of apples. Welcome to the a 2 z meme! If you're joining in the meme, be sure to link up with us at the end of this post. Find more info about the a 2 z meme here. This summer has been busy here. We haven't gardened for years but this year we did, changing my summer plans because a garden isn't just a garden for us, it's canning too. Our oldest son took an interest in our orchard this year too. He did some research then set out to care for the trees. For the first time ever, we have fruit from the trees! 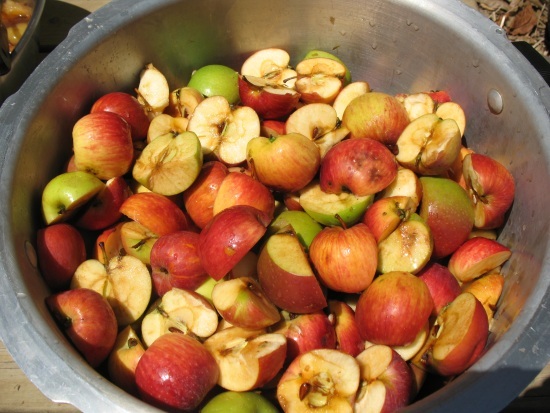 A storm blew down a bunch of small apples and I was able to pick up three five gallon buckets of them. They were too small for anything except applesauce. So, we sauced them. It was scorching hot and the thought of cooking down apples in my kitchen wasn't too appealing. My wonderful, out-of-the box thinker husband suggested pressure cooking them on the fish-fryer burner on the deck. He didn't have to say it twice! 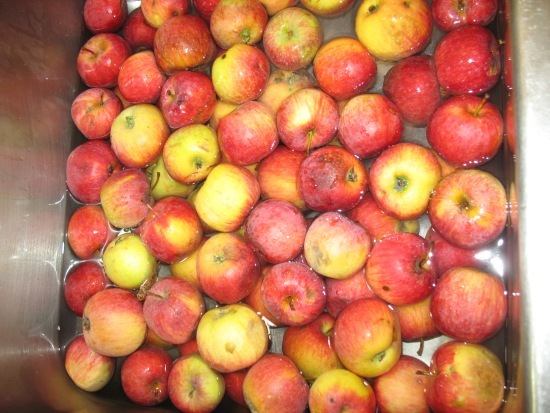 After washing and chopping the apples in half, I filled my jumbo pressure cooker--it's only 16 quarts. ;-) In seemingly no time the apples were cooked. So much faster! When Jim and I married, he was smart enough to invest our wedding gift money into a KitchenAid mixer and attachments. We've had one ever since. This was an all-hands-on-deck project because while we were saucing the apples, Jim was in the kitchen cutting corn from the cobs. The KitchenAid attachment is great. 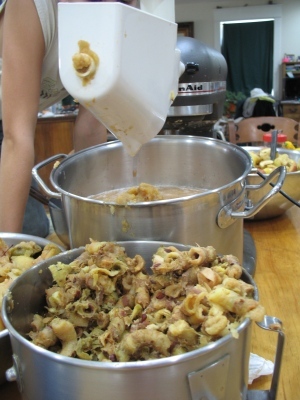 Someone spoons cooked apples into the hopper thingie, they funnel down and are pushed through a through a sieve tube, squishing the sauce out one direction while pushing out the peels and seeds at the very end. Kids love watching it and helping. 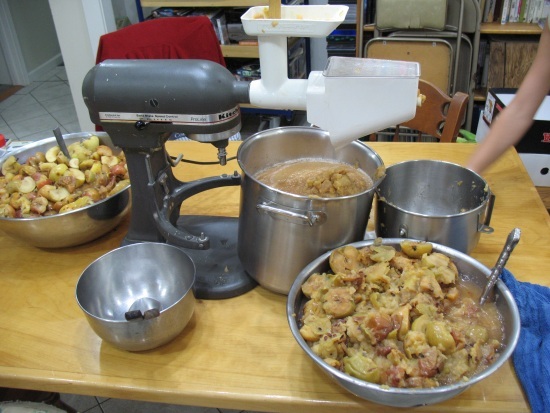 But you do NOT need a KitchenAid to make applesauce! It's been so long since I've made applesauce that I did some quick research to refresh my memory before I started. I found a great site that gives alternatives to the KitchenAid. 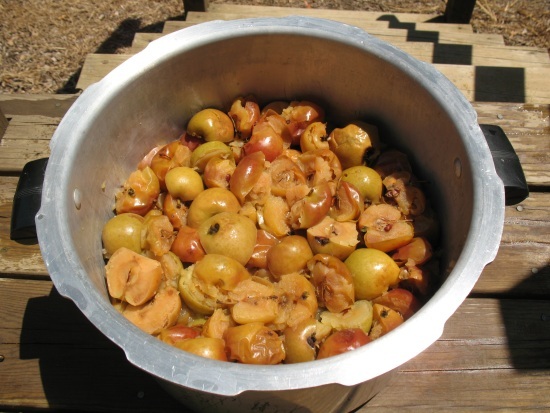 Click here for a great post about the different tools you can use to make applesauce. 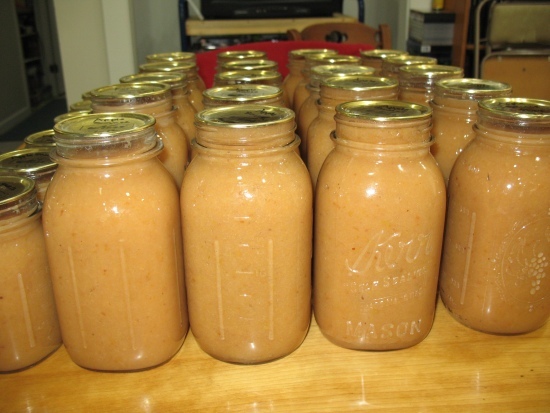 Those three buckets of small apples gave us 24 quarts of applesauce that will be doubly delicious this winter. So, when life dumps apples on you, sauce them! 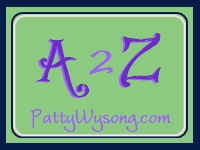 If you're joining us for the a2z meme by posting on your blog this week about the letter A, be sure to add your name and the link to that particular post in the linky gadget here. This is also a blog hop, so go ahead and grab the code and post it on your site so others can join in too. I am not a school teacher. 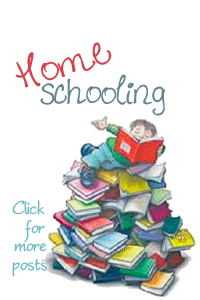 Yes, I've homeschooled my five children, but I don't teach them in the normal school way. Once they reach the third grade, I become the school organizer and facilitator. It's one of the things that has saved my sanity. I know some moms are terrific homeschoolers and they do unit studies and all these other cool things. I tried that and it didn't work for me. I wish it did because I love that concept and I think families who can do that are very fortunate, but it just doesn't work for everyone. I know I'm not alone when I feel like I'm a challenged homeschool mom. 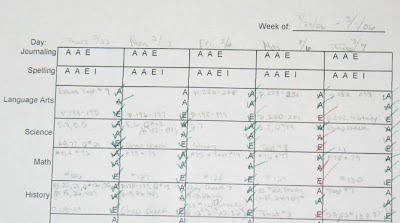 When I first started doing school the way we're doing it now, it was out of desperation to accomplish school and keep my sanity, but now that I see the side benefits, the desperation is gone and I simply tweak my plan as needed. 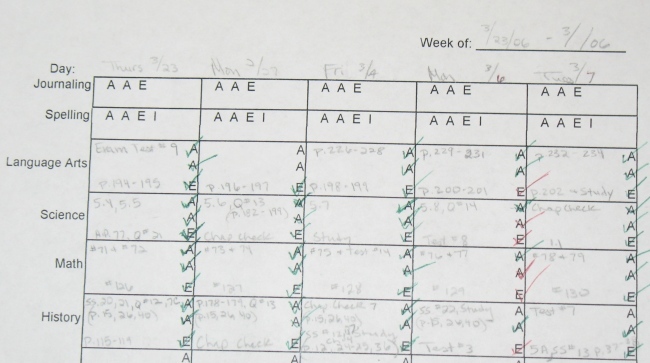 Instead of teaching my children their lessons, I make lesson assignment pages that I can check off when the assignment is accomplished. These include each day's reading assignment, comprehension questions, pages (maps, charts, whatever) to study, quizzes and tests. 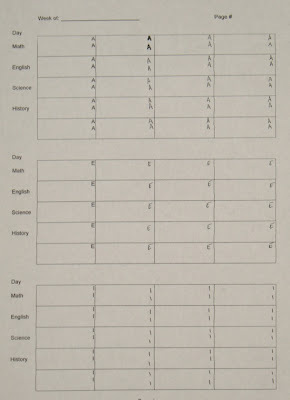 Each child has their own row so one piece of paper has a week's assignments for all my children. With that one paper I can easily keep track of everything I need to for the week and my life is simplified. The kids are responsible for their assignments. They know exactly what is expected of them and what they have to do. They also know that if they buckle down and tackle the job, they can get it knocked out in a few hours and have the rest of the day to do other things, but if they slough off, they'll have consequences coming their way. The children do their assignments and put them at my spot on the table for me to correct. After I correct them, they go back and correct their errors until it's right. I'm available to help them if they run into problems, but I act as a facilitator rather than a teacher. Doing school this way has worked wonderfully for my family. It's made it so we can homeschool even though I'm not a teacher and I don't enjoy teaching. For my children that enjoy school, it's allowed them room to stretch and grow and pursue things they want to learn. For the others, it's provided them the structure they needed to get it done and to learn to be self-motivated. This method made it so I could hand my high schoolers a book, tell them what I expect them to do and when I want it completed and let them go. Through the years they've learned how to divide the work and pace themselves so they can accomplish what they need to in the allotted time. 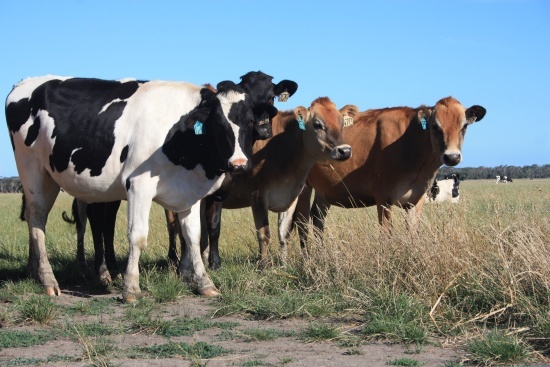 It also enables them to naturally assume responsibility for their own education, which is something that they will carry with them long after their school days here at home and elsewhere are over. 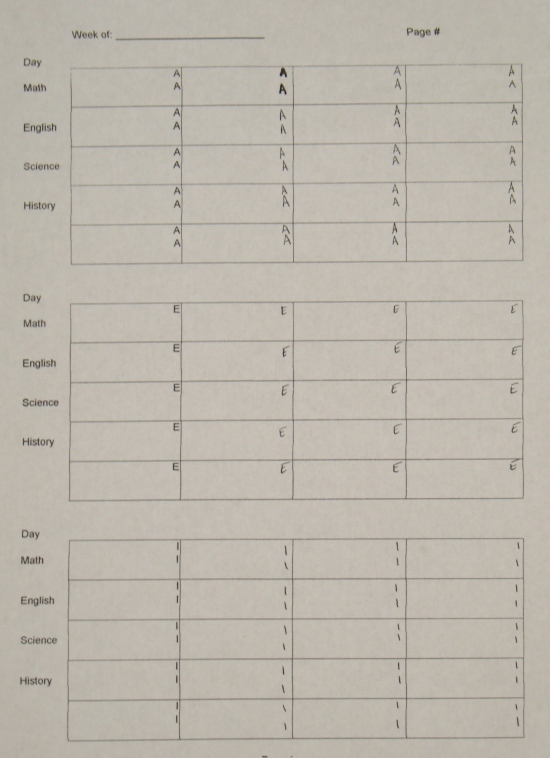 Even those of us who are not teachers can homeschool effectively if we want to. The key is organization. But more than organization is knowing that God wants you to homeschool and that both you and your husband are in complete agreement about it. Not everyone should homeschool, but for those of us who know we're called to it, there is a way to save your sanity even if you aren't a teacher. How many pints of pickles can Patty pack? 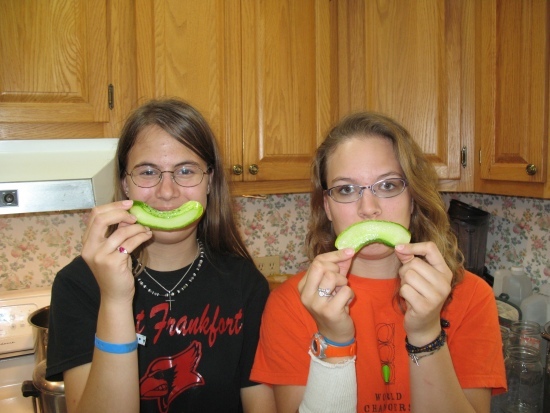 My two girls modeling cuke slices. My kids know nothing about water conservation or water bills. We have an artisan well that we've never been able to empty, even when we tried. The water table is close to the surface on our property and digging the well and setting the holding tanks in the ground was quite an experience--when my husband drilled holes through the concrete tank, water shot into the air. So my kids have never given water conservation a thought and are amazed that people usually pay for the water they use. I was laughing about it later when a truth was driven home to me. I have an unlimited supply of Living Water available to me, but sometimes I live as if I were living in drought conditions and had to conserve water, and pay an outrageous water bill. The truth of the matter is that Jesus paid the bill, for eternity, giving me access to a bottomless well of Living Water that can never run dry. I need to stop limiting the flow of God's goodness into me. I need to stop limiting God's work in and through me. When I live my life in 'conservation mode' I allow just a trickle to flow through the tap, when in reality, God's given me great abundance for all that He's called me to do. Does a fireman sprinkle a bit of water here, and bit there? Does he use a drinking straw to put out a fire while a fire hose lies at his feet? No way. He grabs onto the hose, holds tight and directs the stream of water shooting out the hose. He's not responsible for paying the water bill—it's already taken care of. He's just letting the water flow and using it effectively to put out the fires. It's time for us (for me!) to throw out the piddly straws we've been content to use and pick up the fire hose God has given us. His Living Water is freely given to us and we need to stop conserving it and restricting its flow. When God is given free reign to flow in our lives, His Living Water has far reaching effects not only in our own lives, but in the lives of others as well. Here's our chance to be a firefighter and more! 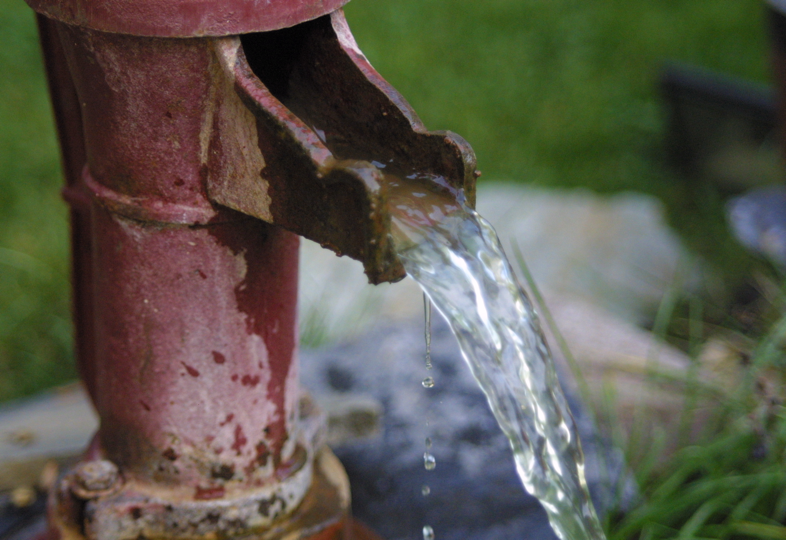 Let's set down our straws and grab onto the fire hose and let the Living Water pour through. Don't worry about conserving it, just let it flow and flow and flow.